Lea_WMDE moved this task from Backlog to TODO/Doing (Design) on the Advanced-Search board. Lea_WMDE added subscribers: Volker_E, Bmueller, gabriel-wmde, Tonina_Zhelyazkova_WMDE. Lea_WMDE moved this task from TODO/Doing (Design) to Tickets ready for pickup on the Advanced-Search board. • Vvjjkkii edited projects, added CheckUser, Connected-Open-Heritage-Batch-uploads (RAÄ-KMB_1_2017-02), Tamil-Sites, Gamepress, Hashtags, Jade, KartoEditor, Language-2018-Apr-June, New-Editor-Experiences, Mail; removed MW-1.32-notes (WMF-deploy-2018-07-10 (1.32.0-wmf.12)). 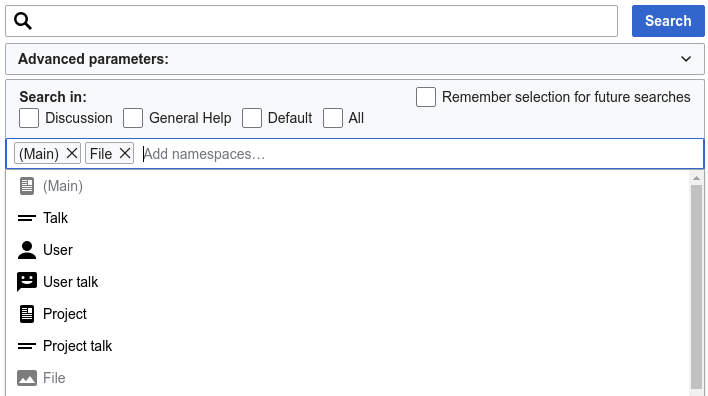 CommunityTechBot renamed this task from n7caaaaaaa to Adjust namespace icons in the AdvancedSearch dropdown to the standard usage.